250 pages, Suggested retail price, $20.95 (Kindle $5.97). ISBN 0972177019. Robert Plamondon says: The Dollar Hen changed my life. 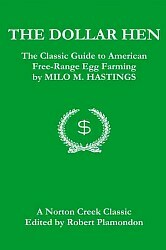 It set me on the road to successful free-range egg farming, and helped me understand all aspects of the poultry industry. Not bad for a book written in 1909! Milo Hastings was a remarkable man. 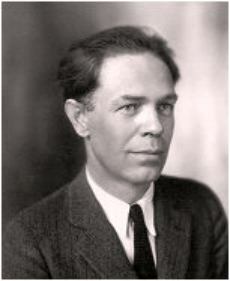 He was a poultry scientist, the author of a classic work of science fiction (City of Endless Night, 1919), an early health-food advocate, and the author of one of the first books on the danger of high blood pressure. The Dollar Hen describes the overriding concerns of being in the egg business. His method of free-range egg farming extracts a maximum amount of synergy between soil, crops, hens, farmer, climate, and invested capital. His goal is to make the farmer money — enough money to pay off the mortgage, put the kids through school, and retire. His methods are simple and the equipment he recommends is even more so. For example, his preferred watering system is a brook. More than any other poultry writer, he emphasizes the value of a farmer’s time and deplores wasting it on unnecessary chores. How can such an old book still be relevant? Because fundamentals never change. The Dollar Hen gives us an overview of relevant business and farming considerations. Hastings describes how a poultry cooperative ought to work (foreshadowing the rules of later co-ops). He points out the important factors in farming and management. He even has a chapter on scientific research and it usefulness and pitfalls when interpreted (or misinterpreted) and applied to the farm. Fundamentals never change. Also, certain fallacies never die. In Hastings’ day, most of the books and magazines being published were aimed at gentleman farmers, poultry hobbyists, and city-dwellers who dreamed of country life — in short, people rich enough to lose a pile of money on their farm or people who didn’t have a farm at all. Such publications, in their happy romanticism and impracticality, were the downfall of many people who tried to put their recommendations into practice. People who wanted to roll up their sleeves and make a real go of egg farming needed sensible, hard-headed advice, or they’d lose all their savings on impractical farming ventures and probably have to move back to the city. Well, guess what? Nothing has changed! 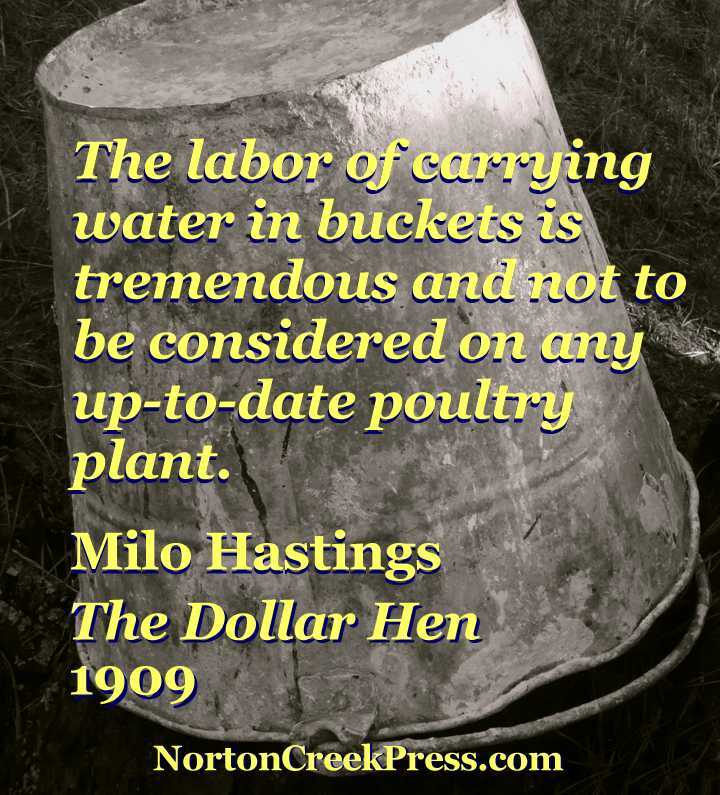 In The Dollar Hen, Hastings guides you through the poultry industry and points out what makes sense and what doesn’t. Even though many of his examples are no longer directly relevant, the habits of thought that he instills in the reader are as relevant now as they ever were. In short, Hastings was a philosopher. But a practical philosopher. Did I mention that he invented the modern forced-draft incubator, or that he wrote a book about the dangers of high blood pressure before anyone else? Well, he did. In spite of his deserved reputation as a visionary, he had his feet on the ground. As the title of The Dollar Hen suggests, the book is about making money, not spending it. People are often reluctant to make a real business out of their hobby farms, but I think it’s the best thing you can do. I learned a long time ago that any farm projects of mine that don’t pay their way are soon abandoned, but ones with significant cash profits are never allowed to die. Profitable farm businesses, however small, give you a reason not to move into town! Every time I pick up The Dollar Hen, I learn something new. Sometimes I take an idea Hastings presents and put it into practice on my farm, with a modern twist. For example, in one place he describes “fireless brooders” that are essentially insulated boxes that use the chicks’ own body heat to keep them warm, and how the most successful use of these that he knew of was as a transitional brooder. You’d brood the chicks conventionally for a while, and then, when they needed less heat, you’d put them in range houses on pasture with a “fireless brooder.” I tried this, using modern materials (chiefly aluminized bubble insulation). It works great! I’ve edited the book for clarity and added footnotes where further comment seemed necessary, but mostly I tried to stay out of Hastings’ way.